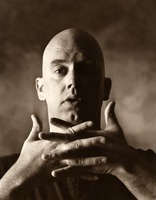 Recorded on February 18, 1988 as part of the San Francisco Exploratorium’s Speaking of Music series, Charles Amirkhanian interviews Paul Dresher and Rinde Eckert about their work in music theater, including their, then, recent show, “Slow Fire”, as well as their collaboration with the Margaret Jenkins Dance Company, “Shelf Life”. Born in 1951 in California, Dresher is an accomplished guitarist and classical and electro-acoustic composer who has performed with his ensemble around the world and has received numerous awards and commissions. Yet he is perhaps best known for his many music theatrical collaborations with Rinde Eckert, an actor, dancer, vocalist, and playwright of enormous talent and versatility. Together they have produced a series of works that explore the American Myth and the alienation of modern man, of which “Slow Fire” was the first and perhaps most famous.